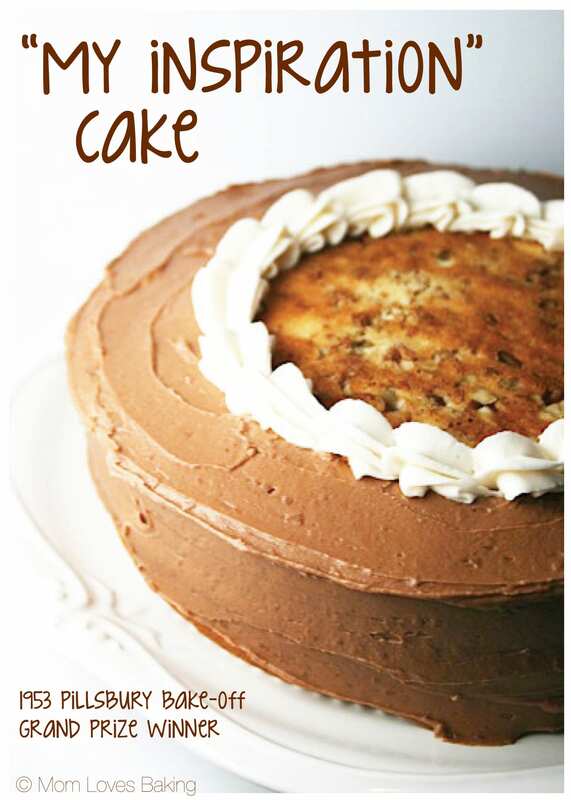 “My Inspiration” Cake won the 5th Pillsbury Bake-Off in 1953. Recipe on Pillsbury.com by Lois Kanago of Webster, South Dakota. 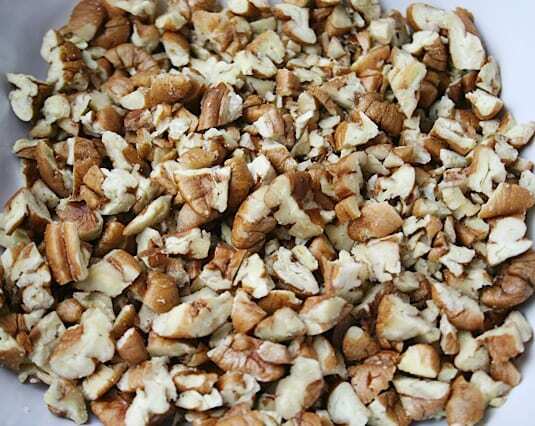 You’ll need 1 cup of chopped pecans. How do you say it? Pe-cawns or Pee-cans? Either way, it’s a good start if you ask me. I love anything with nuts. Do you? 2 oz. of “grated” semisweet chocolate. I used a big Ghiradelli chocolate bar and found that a potato peeler worked better than the traditional grater. Recipe calls for 4 egg whites and no yolks which makes this cake light and airy. You’ll need 2 (9-inch) round cake pans, greased and floured. 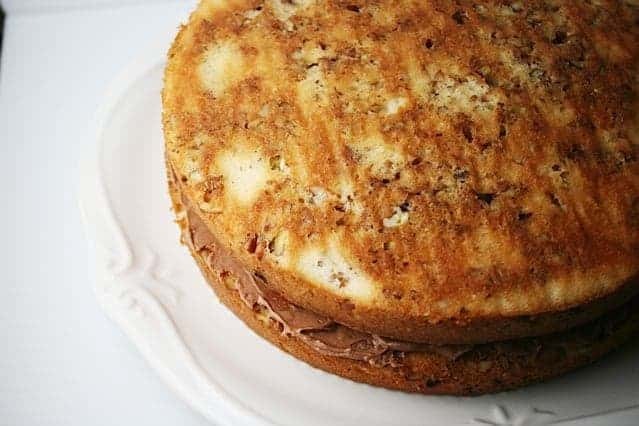 What’s different about this cake is that there are nuts in the bottom of each pan, then 1/4 of the cake batter, grated chocolate in the middle and the remaining batter on top of that. 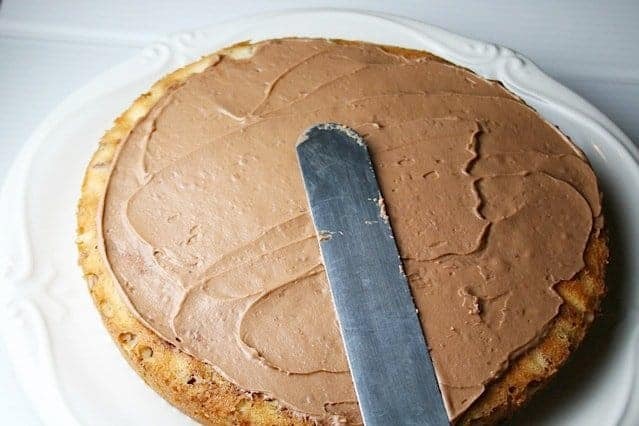 While the cake is baking, you make this traditional chocolate frosting and a little bit of vanilla frosting for piping. Frost the first layer, nuts side up. Then you place the 2nd layer, nuts side up as well. Then you frost the side and the outer edge of the top. Pipe the vanilla frosting around the edge of the chocolate frosting. 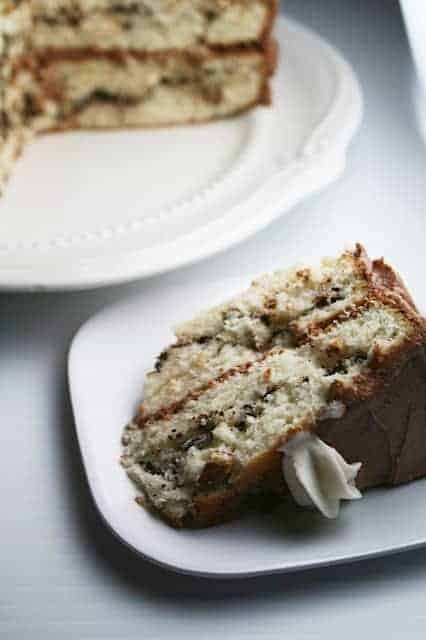 The texture of this cake is light and airy. 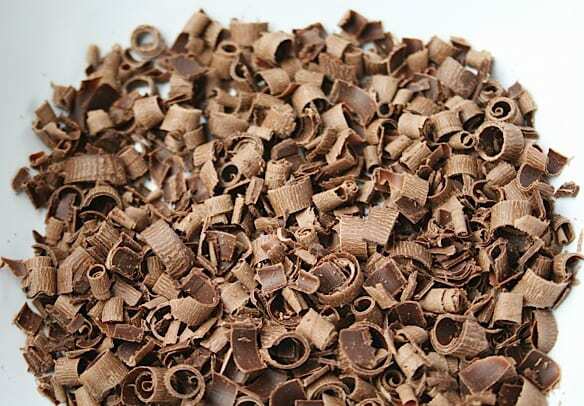 The nuts and grated chocolate add flavor and texture. If I make this again, I will double the frosting amount. I love my frosting. How about you? Stay tuned for Recipe #6 – Open Sesame Pie. Heat oven to 350Â°F. Grease and flour two 9-inch round cake pans. Sprinkle pecans evenly in bottom of greased and floured pans. Lightly spoon flour into measuring cup, level off. 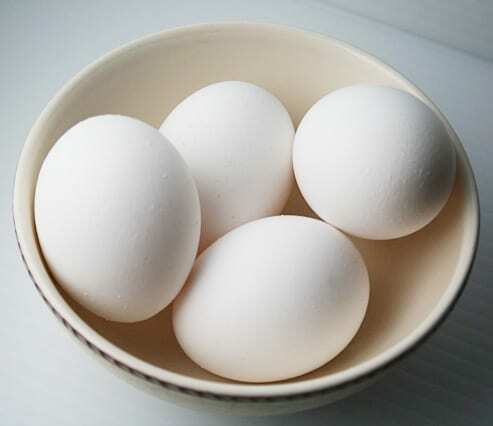 In large bowl, combine all remaining cake ingredients except egg whites and chocolate; beat 1 1/2 minutes at medium speed. Add egg whites; beat 1 1/2 minutes. Carefully spoon 1/4 of batter into each pecan-lined pan. Sprinkle with grated chocolate. Spoon remaining batter over grated chocolate; spread carefully. Bake 350Â°F. for 30 to 40 minutes or until cake is golden brown and top springs back when touched lightly in center. Cool 10 minutes; remove from pans. Cool 1 hour or until completely cooled. 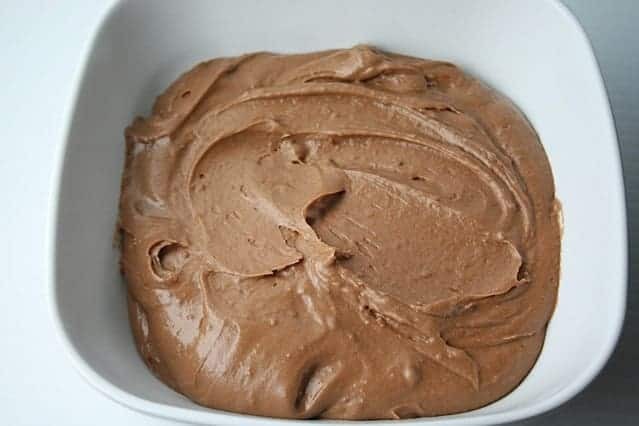 Meanwhile, in small saucepan, combine 1/2 cup sugar, unsweetened chocolate and 1/4 cup water, cook over low heat until melted, stirring constantly until smooth. Remove from heat; cool. In small bowl, combine 1/2 cup shortening and 1 teaspoon vanilla. Gradually beat in 2 cups of the powdered sugar until well blended. Reserve 1/3 cup white frosting. To remaining frosting, add cooled chocolate, remaining 1/4 cup powdered sugar and enough water for desired spreading consistency. 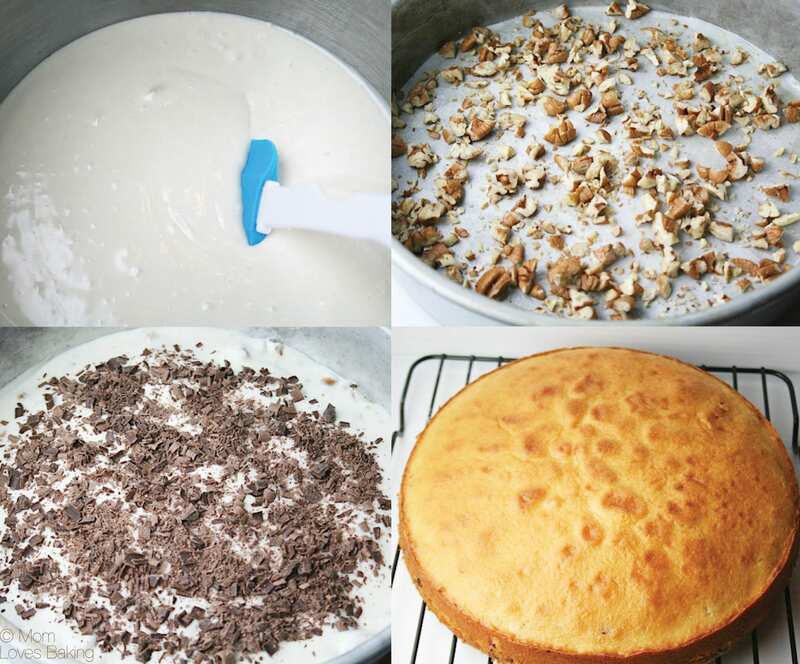 To assemble cake, place 1 layer, pecan side up, on serving plate. Spread with about 1/2 cup chocolate frosting. Top with second layer, pecan side up. Frost sides and 1/2 inch around top edge of cake with remaining chocolate frosting. If necessary, thin reserved white frosting with enough water for desired piping consistency; pipe around edge of nuts on top of cake. Had to see the recipe that won the bake off the year I was born.Boy,how things have changed!